It’s been a few days since Coinbase launched its official Exchange, a dashboard for active bitcoin traders that lets you buy and sell based on real-time pricing. I thought I’d sit down and put it through its paces and see just how usable this tool was for the average BTC fan, as well as folks who might want to add BTC to their trading regimen. To use the service you simply create an account on Coinbase. It should be noted that you have to live in one of the licensed states. It seems Coinbase is rolling out state-by-state for various regulatory reasons, not least being the reticence of state legislatures to weigh in on bitcoin. This should be remedied over the next few weeks but you might be out of luck. Coinbase told Coindesk, a BTC blog, that “the company had received licenses in 14 US states, as well as indications from eight other states including Massachusetts where such licenses were not required.” This means that this is a legal issue rather than a technical one. If you’re in the right state, however, sign-up is a breeze. A few confirmations get you access to a screen featuring a price ledger and some handsome, dynamic charts. An order tracker also reminds you how much you paid for bitcoin at various times, a boon for those looking for an investment vehicle. Once you’re in you’re probably going to want to buy and sell a little. Here’s where things start slowing down. I’m a long-time Coinbase user – I’ve had an account since it launched – and usually my bitcoin buys have been seamless and quick. Now, however, the company is offering a separate USD wallet, essentially a way to fund BTC purchases using the exchange. That is not so quick. If I were a major trader I’d probably want my funding to be a bit smoother, but Coinbase has to be amazingly careful now that it’s touting itself as an exchange. I initiated a transfer from my bank account to Coinbase to the tune of $125 and waited a solid hour for it to come through. Then two. Then three. In fact, as of this writing, it still hasn’t gone through. In comparison, a standard market purchase of BTC via Coinbase takes seconds. This friction could turn off folks who might be in a bit more of a hurry. I was able to trade a bit of my spare bitcoin but the wallet experience left something to be desired. The Exchange is definitely a work in progress but it offers enough tools for the average bitcoin trader. Until now the granularity of bitcoin trades has been fairly limited – you can watch the blockchain all day long, for example, but there was nothing that really offered a closed, usable trading environment. This aims to be that environment. The dashboard, above, should be familiar to anyone with an interest in trading or access to a Bloomberg terminal. 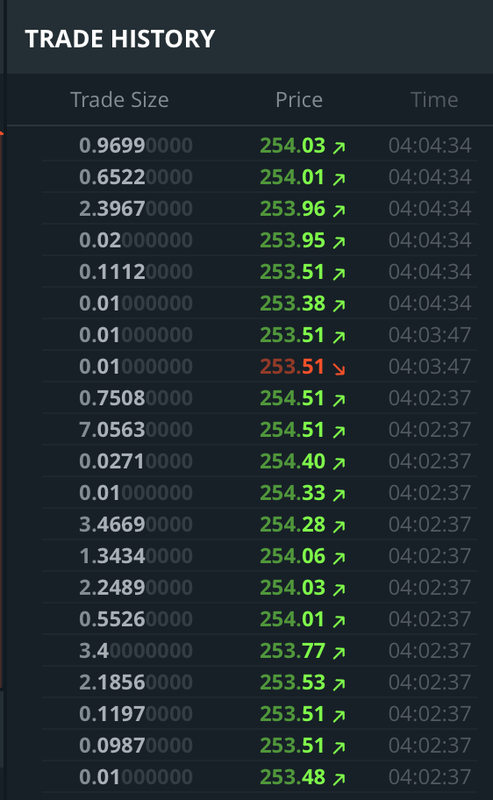 To buy and sell bitcoin in using limit orders – say “Buy $250 worth when the price hits $200” – you simply type it into the buy box. To sell, you do the same. To actually buy BTC at market price, as David Perry writes, you’re forced to head back to Coinbase proper. Nothing is particularly amazing about this – real-time views of the blockchain are common these days – but for Coinbase to create a close, licensed space for buying and selling in a professional way is an important step. There is money to be made in Bitcoin arbitrage and I suspect this is exactly the tool necessary to make it. With big names like Tim Draper splashing out on low-priced BTC and increased interest – partially thanks to Coinbase – in trading the cryptocurrency, expect a brief window where a human with a little money and time can make some serious profit on bitcoin trading. Given the potential of high-frequency trading, however, I suspect that window will be tantalizingly small. The Coinbase Exchange is bitcoin in a suit. It’s grown up, it’s licensed, and it’s legal. While bears will call it a fools game, a lot of smart people are going all in on this platform and it will be fascinating to see just how far it goes in the next few iterations.